Bolt Action – German FallschirmjagerThe world’s first paratroopers to be used in large numbers, the German Fallschirmjager were at the tip of the spear when war broke out in 1939. They led daring assaults on strategic targets, such as the fortress at Eben Emael, enabling the following panzers to overrun Europe.As a paratrooper force the Fallschirmjager’s greatest achievement would be the intense fighting they performed as they seized Crete in the face of more numerous British and Commonwealth forces during 1941. This pyrrhic victory meant that they were never again used en masse.Small units still operated by glider and parachute, famously rescuing Italian leader Mussolini, and raiding behind American lines in the Ardennes. Their finest hour would undoubtly be the bitter fighting as they occupied the monastery at Monte Cassino for months in the face of overwhelming odds, earning themselves the nickname ‘Green Devils’. 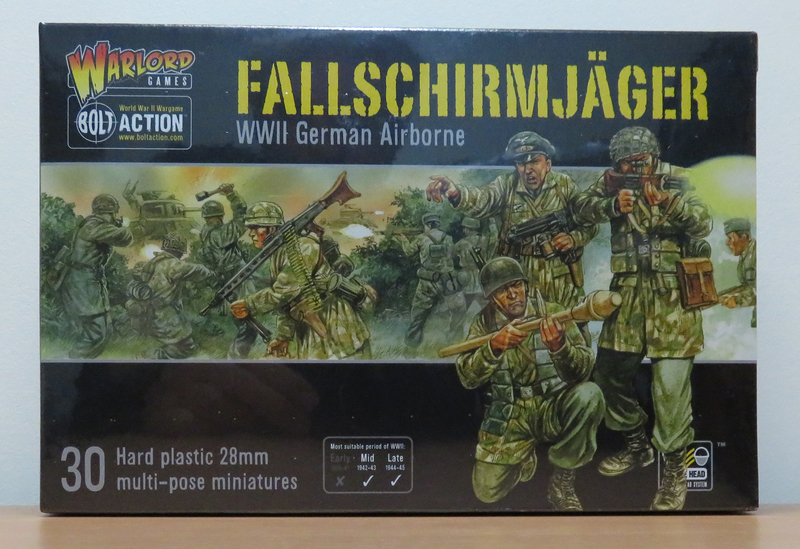 The German Paratroopers were arguably the toughest in a tough army.Warlord Games Fallschirmjager miniatures are ideally suited for battles in North West Europe and can also be used in actions on the Russian Front.